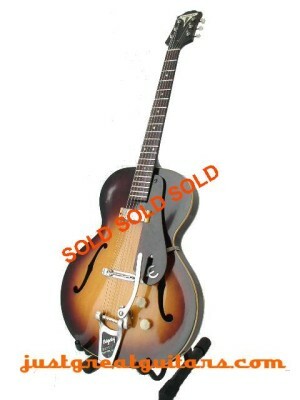 It was made in 1959, just two years after Gibson bought the Epiphone company. At that time they were still using Epiphone parts and tone woods but, had moved production to Kalamazoo gaining all the benefits of Gibson’s production facilities with the instrument-making knowledge of Epiphone. Later, this model would become almost identical to Gibson’s ES-125T, but at this stage, it’s a noticeably different animal, and it’s no exaggeration to say it’s 300% better than the equivalent Gibson model. Collectors know that it’s these Gibson-made Epis that sound the best, hence they are the most desirable and collectible. The overall condition is very good. There are some small finish marks on the back, just visible on the picture, they have been retouched at sometime in a sympathetic and honest way. There’s a tiny ding on the top at the upper bout just about an inch above the level of the pickup. The Bigsby wasn’t factory fitted, and you can see an old tailpiece hole near the end-pin in the photograph. However, Bigsby’s are always good to have, so we’ve kept this one on the guitar. Why’s it so inexpensive you may be wondering. Good question and you should always wonder about such things! This guitar has a professional (and guaranteed stable) neck repair, wiping £500 off its value. Good news if you want to get your hands on a fine-playing, lovely-feeling, genuine 50s article. How’s it better than the Gibson ES-125T? It looks different: the top features figured maple on a ply base that’s thicker and more acoustically responsive. The enamel metal nameplate reminds one of quality engineering as seen in the times of, well quality engineering, as compared to Gibson’s transfer of the same period. It is certainly a very good quality instrument, evidenced by the good condition of the 50 year-old Century’s we’ve seen. (Also by the fact that Epiphone couldn’t afford to keep making them!) Those wonderful octagonal knobs must have seemed so futuristic at the time. It feels different: it’s 1½ lbs heavier (at 5½ lbs). The three piece neck has a slight ‘V’ with a section that’s somewhere between the rounded Gibson fifties neck and the low profile Gibson neck of the sixties. So the neck feels different to the Gibsons, but you very quickly appreciate that it’s a better section. It has a longer scale length at 25½” (same as Fender) which helps to lend this guitar the most surprising acoustic brightness and volume. You wouldn’t perform with it acoustically, but it’s easily loud enough to play that way when practicing in a quiet room. Finally, it sounds really different: The New York pickup has a distinctive smooth and buttery sound that would make any vintage tone aficionado drool. It has a great tone that doesn’t lose the highs or and make the low tones boom, which is usually the case with the later P90s which Gibson started fitting later the same year as they used-up the stocks of Epiphone’s New York pickups. This would be one of the last Centurys fitted with the New York pickup. Amazingly the tone control actually works throughout its range, and even the volume pot seems to be more even in its control over the output. Only when you’ve held and played this guitar will you know see why these Kalamzoo made Epis are so desirable.